Epsom salt bath with a mimosa to start the day. Breakfast at Camp A-ndi-CL consisting of green juice, smoothies, lots of bacon and fried egg bagel sandwiches. Fill roadie cup, head out. Last week was a favorite at noon (In the Valley Below), this week brings someone else’s favorite Holychild or Fidlar. Holy child is Indie pop with laced with electronica, they are a hyped start to the day (though not my cup of Ketel). Fidlar, a skate/garage punk band from LA, is the other option. You can find me at Riders Against the Storm – Austin-bred hip-hop legends who have also won “Band of the Year” 2014 and 2014. Up next is Bee Caves. Named one of Paste Magazine’s 25 bands to see during SXSW 2015, the Indie group from Austin opens for Band of Horses for ACL Late Nite show on Friday at Stubb’s. Good enough for Band of Horses, good enough for me – plus any band that earns a reference to Explosions in the Sky, earns a listen. Milo Greene is a solid showing at 12:45. Unusual in that there are four lead singers, the folk-pop band delivers dynamic vocals due to their unique stocking of voices. Since I saw this show last week (and again after Band of Horses), I will be sticking Bee Caves out and catching some Milo afterwards. 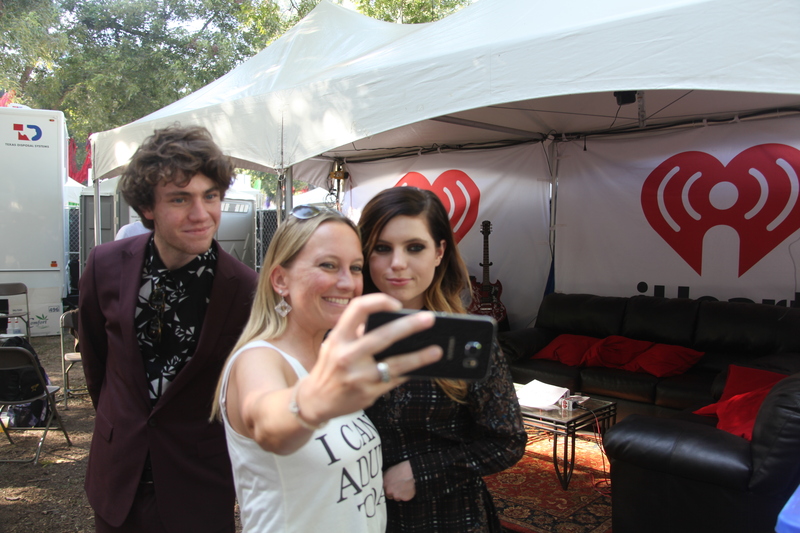 Also up in this time slot is the pop band Echosmith, an indie pop band that gives a great – albeit pop-ish- performance. Then one of my girl crushes – the first of the day – Ryn Weaver will do all things awesome on stage. If you aren’t familiar with her, get that way. Her shows are electric; high energy with great sound. Her vocals are unique in tempo and honestly, she is just freaking amazing. I barely have time to recover from Ryn before going into the baby-making grind zone that takes over the Samsung stage. The musical genius (no really, front man David Bayley has studied neuroscience and medicine) behind this phenomenon is the UK’s Glass Animals. I’ve seen these guys multiple times, I promise you can never get enough. The Indie rock band has heightened intensity on stage, making the audience sway. Bayley pairs the most bizarrely perfect dance moves to his peanut butter vibes. Also up is Father John Misty – who I love, but who did not do it for me last week. Once you go Glass, you never go back. Beeline to my other girl crush, Mandy Lee, on stage with MisterWives. The crowd will swell quickly for this high-energy indie pop show. I will never not see MIsterWives – they are so talented and electric. The energy gets in your bones and you just jump. Plus, I have a huge crush on Mandy Lee. I will probably stay on the outskirts this time around to try and catch some of Houndmouth, whom I’ve never seen live, but hold great potential for a folksy rock show. On to Sturgill Simpson. This country rocker is another show I will never miss regardless of how high our number is. You will stomp, you will holler, you will be amazed by his sheer talent. If you aren’t – please leave my park. Here comes the block that I care about least for the day. You know what that means…food. Grab a Mighty Cone or Gyro from Tino’s (if you’re feeling really naughty, grab a Waylon & Willie from Burro Cheese Kitchen) and a daily juice. I will mosey to Walk the Moon (because I have to) per friends desire and my apathy. They have two songs I love and dance like a six-year-old to (I jump up and down and flail my arms about wildly). G-Eazy is a good choice too. Unknown Mortal Orchestra wasn’t bad for my eating break last week. I am torn between Modest Mouse and A$AP Rocky. I’ve seen both numerous times and both are good. Really torn here. Thanks C3. TV on The Radio is an incredible band. Their show was awesome (though not as awesome as I’ve seen them before). This week I will check out Bassnectar to get some crazy dancing in before heading to Borns at Stubbs for ACL Late Nite show. If you haven’t seen TV on the Radio and you like real music (sorry Bassnectar), check them out. Have fun with the headliners. Neither are anything to write home about. I suppose I would suggest seeing some of each, though Deadmau5 delivered a sub-par performance for himself in general and Drake is not my cup of Ketel for longer than 10 minutes (it’s too ADD, just play a whole song, man). Uber home. Epsom salt bath. Finish pot pie. Pass out (hopefully, not in the bath).